There are things that researchers will not be able to pinpoint precisely. No record might exist that provides great-grandfather’s exact date of birth–and March of 1874 may be as specific as you are going to get. Keep perspective though. Bigger concerns are that you have this ancestor tied to the right parents, sibling, spouse, children, etc. A date of birth that is not specific is not always the end of the genealogy world. Is the Wife Listed First? I’ve seen quite a few deeds in my genealogy research. Recently I located one where the wife was listed first, instead of the husband. What it likely means is that the money to buy the house in Chicago was hers, in this case likely an inheritance from her father. It is rare to see a woman listed first in a legal record when she and her husband are listed. If she is listed first, see if you can determine why. More material than ever is available in digital format, either free or on a fee-based site. Remember that a significant amount of material exists only in paper form, in the original location where it was recorded. You are missing out if you only access digital images and microfilm. Planning a trip to a remote courthouse or archives this summer? Do not assume they will be open just because you are coming. Offices have temporary shutdowns for a variety of reasons. Find out before you go–not when you are at the office door. Farmed Out At A Young Age? You’ve found your ancestors in the 1850 census, but there appear to be gaps in the ages of the children. It is possible that some died and it’s possible that some are living with neighbors or other family members, perhaps helping out with children, farm work, etc. It is also possible that great-great-great-grandma didn’t have any children between Henry in 1832 and Sarah in 1840, but there might have been ones in between that are either deceased or just are not in the household. Just because someone is left out of an ancestor’s will does not mean they were not the ancestor’s child. They might have received property earlier or might have had a falling out with the parent and been left out of the will for that reason. Sometimes a will will mention the child and give them a dollar or a mere pittance so that they cannot say were left out, but that doesn’t always happen. The 1850 era will of Thomas Chaney in Bedford County, Pennsylvania, only mentions a handful of his ten known children. Did They Get Off a Line? Is it possible that the census taker got off a line while writing up the actual census that we are using? It is possible that he got the ages off and didn’t even notice it. 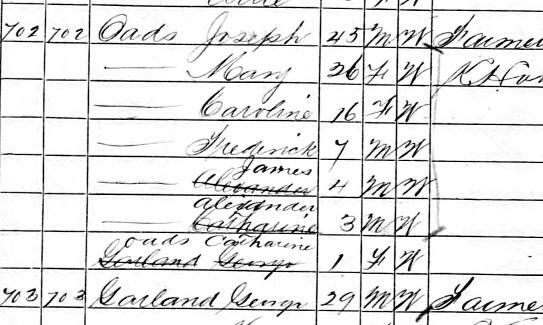 This image from 1870 in Nebraska shows a census entry where it was realized that a mistake was made–but it’s always possible the enumerator didn’t realize or care that he made a mistake. Do You Need to Insert Some Sicness in Your Transcriptions? Remember when transcribing any document items should be copied as is. If you see an obvious error, you may wish to insert [sic] after it to indicate that the mistake was not yours. Think about all that you know about your “brick wall” ancestor. Now, cross one of those “facts” as being not true–even if you really think it is. How would your research approach change? What would you do differently? Where else would you look? Now, is it possible that one or more “facts” aren’t true? When finding anyone in a census record, remember to read the entire page. There may be notations in the margin and at the very least those columns on the “edge” sometimes do mean something. Remember that some early census records are spread over two pages. There may be clues lurking off to the side.